Leslie Frazier's firing, with a 20-32-1 record, seems a foregone conclusion after a second disappointing season in three years as the Vikings' head coach. Closing out the Metrodome, the Minnesota Vikings will try to end the stadium’s long history with an opponent that hasn’t offered much resistance over the years. The 2013 season will be bookended by two games against the Detroit Lions. Minnesota is 23-7 against Detroit in the Metrodome, home to the Vikings since 1982. Sunday’s game will be the final event in the stadium’s 31-year history. The Vikings were original tenants and the last team to call the Dome home. Potentially there are several other "lasts" that could come about Sunday. While the Dome is certain to be ending, Sunday could be the final time in a Minnesota uniform for several players, including Jared Allen and Kevin Williams. 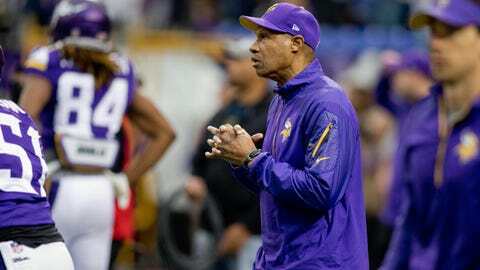 Sunday is also likely the final game for Leslie Frazier as head coach. All will want to go out with a big performance. Allen has the third-most sacks in team history since sacks became an official statistic. Allen’s 83.5 sacks in his six seasons for the Vikings rank just behind John Randle’s 114 sacks and Chris Doleman’s 96.5 sacks with Minnesota. Williams, the longest tenured current player with the Vikings, will be playing in his 83rd game at the Metrodome, the seventh most in team history. Williams, a five-time first-team All-Pro, has had a long distinguished career with Minnesota. Allen and Williams are finishing off the final season of their current contracts. Frazier has been a part of the Vikings since 2007, starting as the team’s defensive coordinator and then taking over as head coach with six games left in the 2010 season. Frazier’s firing, with a 20-32-1 record, seems a foregone conclusion after a second disappointing season in three years as the head coach. Rookie Cordarrelle Patterson hasn’t had a kickoff return in the Metrodome in the past two home games. He only needs one to establish a new franchise record for kickoff returns. Teams have avoided Patterson as much as possible in the second half of the season and the Metrodome provides the perfect atmosphere for not giving Patterson any chances. Patterson has a league-high 1,342 kickoff return yards this season, three away from Buster Rhymes’ team record set in 1985. Rhymes averaged 25.4 yards per return as a rookie in 1985. Patterson’s 33.6-yard average leads the league this season. Patterson has also scored touchdowns in four straight games, the first rookie since Randy Moss to accomplish the feat. Patterson’s multi-usage has grown this season and he’s the only player in the NFL this season to have multiple touchdowns returning, receiving and running. The final home game in Metrodome history could see more records created, one the Vikings would rather avoid. Minnesota is 17 points away from giving up the most points in a season in team history, 18 would establish a new record. In 1984, in Les Steckel’s one season as head coach, the Vikings allowed 484 points, an average of 30.25 per game. Anytime a team is compared to Steckel and 1984, its usually a bad thing for the current team. Minnesota has allowed a league-worst 467 points this season, an average of 31.13 per game. All phases of breakdowns have been the cause, not just the late-game collapses that have become the focus. The Vikings’ long-held defensive Cover-2 scheme has been a mess with injuries hitting a secondary without much depth and the pass rush not holding up to its usual standards. Detroit comes to town with the league’s 11th-best scoring offense, averaging 25.5 points per game. The Lions scored 34 points against Minnesota in the season opener. Minnesota has been in the top five in sacks in five of Allen’s six seasons with the team and Allen has led the team in sacks every season since he was acquired by the Vikings in 2008. Allen is in jeopardy of missing double-digit sacks for the first time since 2006 with the Kansas City Chiefs. Allen leads the team with 9.5 sacks. He is pushing for double-digit sacks, a total he admittedly strives for each season. Allen is also a half-sack shy of pushing into 13th place alone in NFL history in sacks. Allen is currently tied with Derrick Thomas with 126.5 sacks. Defensive end Brian Robison, who has appreciated working with Allen over the years, wouldn’t mind stopping Allen’s streak of leading the team in sacks. Robison and Allen have a friendly competition going this season and Robison is second with nine sacks. 5. A final Metrodome moment? Adrian Peterson has created a lot of big moments in the Metrodome’s history. He set a league-record with 296 rushing yards in a single game as a rookie in 2007. His five games of 200 or more yards are one off the NFL record, but he’s only had one such game in the Metrodome. He surpassed 2,000 yards last season, becoming just the seventh player in NFL history to reach the mark in a single season. Alas, Peterson might not get the chance to make one more memory. Peterson, who has dealt with a sprained right foot and groin injuries, is doubtful for Sunday. Backup Toby Gerhart has already been ruled out for the Vikings’ run-first offense. If Peterson is unable to play, Matt Asiata would again take the responsibilities as the lead back. Playing for Peterson and Gerhart in the last home game, Asiata had 30 carries for 51 yards and three touchdowns. But you can trust Peterson would like one more moment in the Metrodome.